The story does not finish here; there have been many enquiries as to the whereabouts of the remaining fleet? Unfortunately (that is until 2004), no other A.O.D. has been traced. One exception is Gemini No.8. She had remained in Graham Davis’ ownership throughout, although laid up a number of years ago. Time had taken its toll on her, but with the renewed interest in the class, Bryan, Graham’s son, decided to take on the task of restoration in 2003. Subsequently Gemini has undergone a total refit in Peter’s boatyard at Bodinnick. This included replacing some of the planking, many of the ribs, transom and reinstating the centre board case. Bryan with considerable help from Graham then spent numerous hours scraping, sanding and varnishing, of which the end result is superb. She was re-launched on the 11th of July 2004, requiring absolutely minimal plimming up, a credit to both Peter and Bryan. 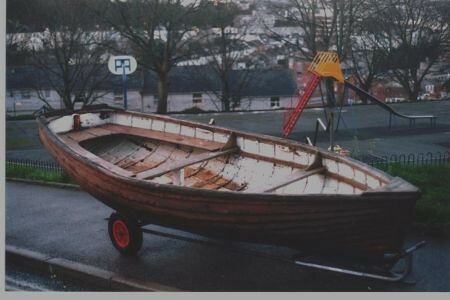 As mentioned tracing any other Axe Ones has until now proved fruitless, however Nigel Daniel made a chance enquiry regarding a ‘rowing boat’ moored out in Torquay harbour early in January 2004. At a distance the boat showed similarities to an Axe One, the contrasting elm planking forward being recognisable, although the addition of a heavy gunwale strake disguised the appearance. Closer inspection was required. Having contacted the owner it transpired that the boat was for sale. Mr Peter Dart of the Torquay fishing family had used her as a ‘punt’ for over twenty years in the harbour, having purchased the boat at the Shaldon Boat Auctions in the late seventies. 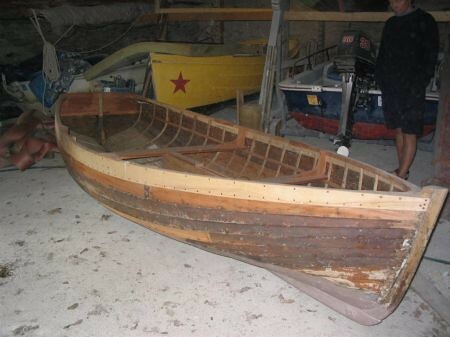 Disappointingly, when asked of the boat’s origins Mr Dart thought she had been built by apprentices at Devonport. This would have ruled out the possibility of the boat being an Axe One Design, since all were built in the locality. Happily a return trip to Torquay allowed closer inspection ashore, confirming that she was indeed an Axe One Design. Obviously there was only one course of action – to bring the boat back to the Axe, so Nigel promptly made the purchase. Once back in Axmouth, ownership was transferred to his brother Stephen and a programme of restoration commenced. She has had some hard use over the intervening years and has required a substantial amount of work to bring her back into a seaworthy sailing condition. Pete Williams once again took on the structural work of the restoration at Bodinnick. Parts of the stem and transom have been replaced, along with sections of planking which have been badly scarred. At some stage the boat had been re-ribbed with much larger gauge timbers. This has been a mixed blessing since it has helped retain the boats shape but on replacing with the original smaller ribs it has meant plugging endless redundant rivet holes with mahogany spiles. The thwarts have been replaced and the centreboard case reinstated. Peter completed the structural work in October 2004. Stephen then commenced the cosmetic work to rectify the years of hard use – scraping, plugging, sanding and varnishing to bring her back to something like her original condition. She was eventually re-launched at Ashlett Creek (Solent) in June and returned to the Axe in July to rejoin the fleet which now totals six. She came a very credible second place in the July river race, her first for probably some 35 years. We may be a little nearer to identifying the true origins of Swallow. 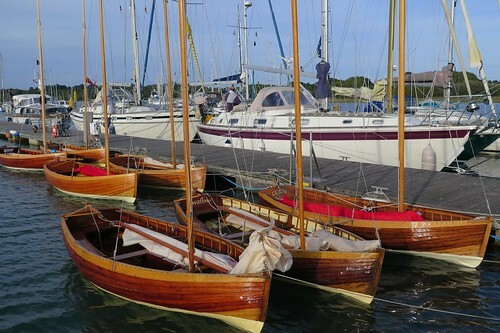 The individual hull planks match identically with the other two original boats, No.1,Whimbrel and No.8, Gemini, however the mahogany is much darker. 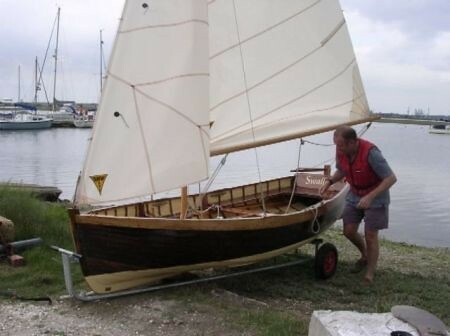 Coincidentally Bernie Webber and Gareth Mettam had built their boats using re-cycled mahogany. This had come from a refurbished bank (counter) in Taunton and turned out to be much darker than the timber used for the rest of the fleet. Unfortunately Bernie’s boat had been wrecked on the beach having been washed away during a summer gale in 1959, however Gareth’s boat was eventually ‘sold on’ in the late 1960’s. Gareth has been down to the beach to have a good look at Swallow, but obviously after many years it is not easy to recognise a specific boat (especially being a one design), however there’s a good chance she could have been the original No.16, but we’ll probably never know for sure. It was therefore decided to give her one of the original numbers and being the sixth boat of the present fleet, she has been given the number six .